Crisis Observer :: International Portfolio :: PRO IT Service S.R.L. - Choose a professional and accessible service for your online image! I'm having an excellent, now long time, working and human relationship with the Italian journalist and entrepreneur Paolo C. Conti. As a matter of fact I've also met Paolo in Bucharest, in September 2009. Crisis Observer is just another project we've worked on together. Paolo had the idea to leverage somehow this financial crisis that the whole world goes through. Considering that he is a reputable journalist and that he knows so many other valuable journalists, Paolo proposed me to build together a Web site just about this financial crisis called 'Crisis Observer'. I've been working with Paolo on a couple of other web site projects, such as for instance paoloconti.net and toolazytodoit.com, both developed using the movable type publishing platform and hosted under PRO IT Service hosting facilities. What is nice about this Crisis Observer project is that the look and feel has been designed by Paolo himself using Adobe Illustrator. He sent me the art work in .AI format. I took his design and started to code the different types of pages in web page format, using xhtml and css. The technique I've used is table less and in tune with the latest tendencies in web development. After I've hand coded the home page, the individual article Web page and a couple of other Web page types, I've tested them across the most popular browsers (Microsoft Internet Explorer, Mozilla Firefox, Apple Safari and Opera) and I've validated the source code using the W3C (world wide web consortium) xhtml and css validators. As soon as I was ready with the art work coded in Web page format, I shown them to Paolo and we've made the final refinements, here and there. The next and most important step was coding this project within the movable type publishing platform. I'm using movable type since December 2002 and so I've gathered a long time experience delivering hundreds of Web site project. Building Paolo's Crisis Observer was just a matter of time. Working on this project was a very nice experience. While at the first glance one may not realize the complexity of the job, in reality there were a couple of interesting features Paolo was interested on. For instance, Paolo wanted to associate an image to some of his articles and to have that image automatically resized to fit a certain box up there on the Web site header (see the 'Picture of the day' and 'The lighter side of things' sections). For the 'Pictures of the day' section, Paolo wanted to display a button called 'enlarge' which to allow the visitor see the full size picture. Another interesting feature is the 'suggest us a story' form which is basically made of a field and a button labeled 'go'. I've implemented this feature using AJAX, so that the form will interact with the visitor right on the page the visitor is, avoiding this way to port the visitor to another Web page only for this scope. This way, after submitting a story, the user will see a nice thank you message! 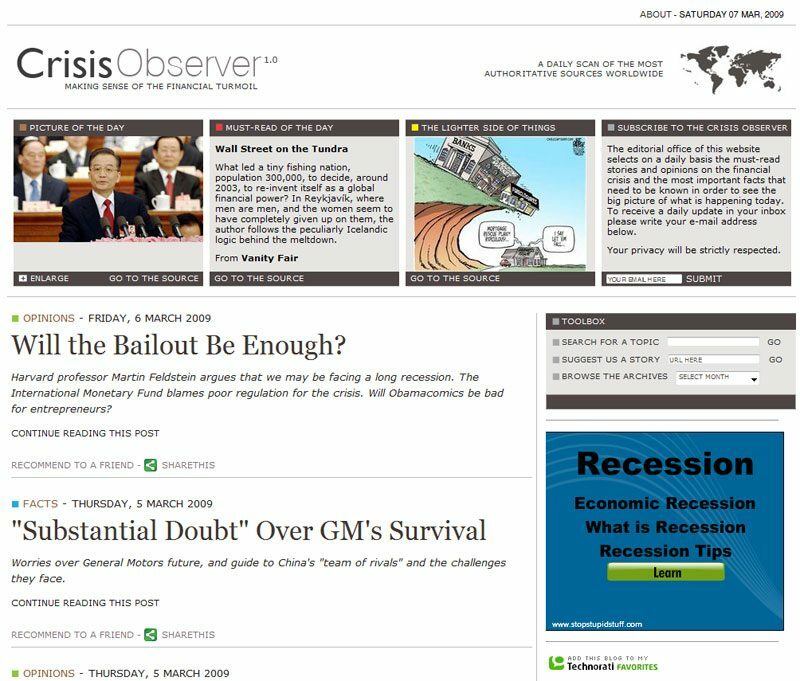 Worth mentioning is also the facility I've made possible for Paolo for managing (adding, editing or removing) entries on a blogroll that he wanted displayed on the sidebar and called 'The Crisis Observer Sources'. Furthermore, Paolo wanted to organize this blogroll in sub-sections (i.e. U.S. and Canada, Europe, Middle East and Africa, Asia-Pacific and Australia, Latin America and Blogs and News Sites). The Web site is monetized using the Google Adsense program. Last but not least, the Web site is optimized for search engines and through this optimization new articles are indexed by Google within 24 to 72 hours. As you may guess, the project is hosted inside one of PRO IT Service web servers. 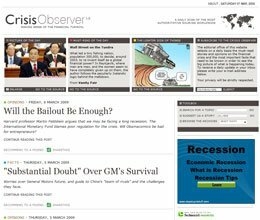 Let me show you two captures of the Crisis Observer Web site. If you want to see it in online, just point your browser to www.crisisobserver.com. Contracting from Cedites, Milan, Italy.